On that little transistor, my big sister's radio. Tommy Castro's song, Big Sister's Radio (from his most excellent album, Painkiller), paints a picture of a time and practice that's probably quite familiar to those of us who grew up in rural areas during rock-and-roll's "Golden Age" (I'll let you figure out when, exactly, that was). I have fond memories of sleep outs in our back yard, under star-filled West Texas skies, listening to the same kind of transistor radio described by Castro ("...one speaker...one dial"). Depending on weather conditions, we could pick up border-blaster stations from just across the Rio Grande (XERF, XELO), Fort Worth (WBAP), and of course, everyone's favorite, KOMA in Oklahoma City. Anyway, these memories were resurrected by another item from Debbie's mom's collection of memorabilia, which I introduced yesterday. I haven't been able to find much about Monte Magee. 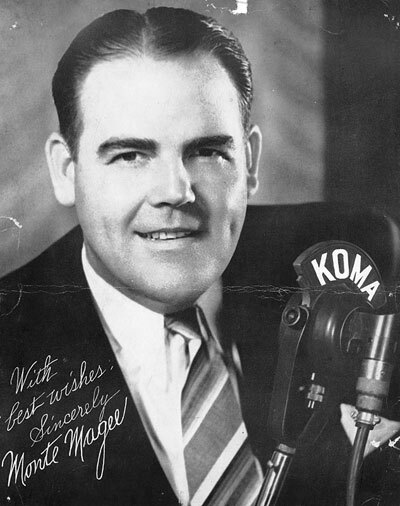 On this site, there's a reference to his being a radio personality from San Antonio, and in a catalog of copyright entries, under Musical compositions, there's a reference to a 1938 song entitled In that old fashioned way where the music and words are attributed to a Monte Magee. That year is consistent with the dates of the other items in the memorabilia collection, so I assume it's the same guy. Now, in case you're wondering, 1938 was WELL before the time I was listening to KOMA on that little transistor radio, and I somehow doubt that the DJs of my time were wearing suits and classy striped ties. But I'm sure some kid, somewhere - perhaps in another area of rural Texas - was held in thrall by Magee's voice and music. This page contains a single entry by Eric published on October 15, 2010 8:41 AM. Light Crust Doughboys was the previous entry in this blog. Fair Weather Fan is the next entry in this blog.